What was here before... Ravenswood only occupies the last seven years on this property- but what was here before Ravenswood...? Before the Trumpet Vine...? or...? Following is an evolving history of the property. As I discover new bits or correct old bits, I will change and update. By the way, that is Elinor Kniffin in the photo above! She came for a visit in August, 2014. The diner's equipment was listed in the 1952 deed. Most items are still recognizable (ice cream scoops, hot fudge warmer, deep fryer, for example). But what the heck is a Heinz bean warmer? (a slow warmer with the Heinz logo on the side. An ad specialty from the company to sell its beans). 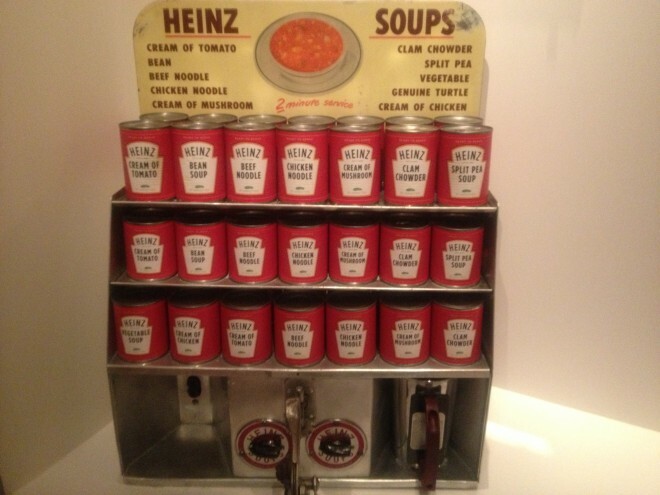 And then there is "Heinz Soup Kitchen with cup" - A self-serve canned soup warmer, pictured below. Customers could pick out their favorite soup and warm it up in the cup. The inventory gives an idea of the food offered- steaks, hamburgers, hot dogs, French fries, soup, ice cream, and, of course, coffee. The seating capacity was tiny by today's standards: two tables with 8 chairs, and a counter with 10 stools. This is a slightly older soup kitchen, but it would have been very similar to the one found at the Snack Bar in 1952. Pick the soup, open and pour into the cup, set the timer for 2 minutes, and presto! Hot soup. Ruth died at the property November 6, 1987. Ravenswood Natural Health opened its doors March 13, 2010, with a grand opening May 29, 2010. The structure was cleaned and repaired but the architecture remained unchanged until 2012. In 2012, the interior was reconfigured to utilize the original bedrooms as commercial office space. This project removed one interior doorway and three closets. It added a semi-private, shared entry and waiting area and brought all rooms up to current commercial fire code. In March 2014, design build firm D.E. Jacobs was hired to open the old living quarters to expand retail space.